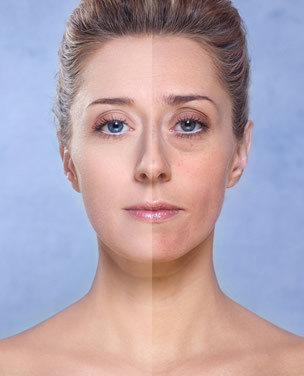 A “liquid facelift” is a popular term for nonsurgical facial rejuvenation. A combination of dermal fillers, volumizers and Botox can provide a noninvasive solution for a refreshed, rejuvenated look. A liquid facelift works best on faces without significant laxity or advanced signs of aging. As your skin ages it loses collagen and the collagen that remains becomes haphazardly organized. The loss of collagen leads to the appearance of fine lines and creases. At the same time bundles of elastin in the skin lose their spring and the skin begins to sag, most noticeably in the jowls and neck. During your liquid facelift consultation, Dr. Kolstad will determine what products you will require to help you achieve the look of you desire. Each problem area on the face has a specific treatment, such as Restylane for the eyes, Radiesse for the nasolabial folds and Scultpra for the cheeks. Dr. Kolstad will tailor a unique treatment strategy to meet your individual facial features. If you have questions about “liquid facelift” in San Diego, please contact Kolstad Facial Plastic Surgery to schedule a consultation with Dr. Kolstad. You may call our office at 858.859.2563 to schedule your appointment today. We are conveniently located in in La Jolla between I5 and I 805. We serve men and women in La Jolla, Del Mar, San Diego, Rancho Santa Fe, Solano Beach, Encinitas and Southern California.